During March and April 1989, with little sign that either the government or the MNR insurrection could achieve a military victory, it was becoming increasingly clear that some kind of mediation would be needed if a negotiated settlement was to be achieved. The question was, who could play such a role? There was much stubbornness, accompanied by posturing on all sides. The government stuck to the line that the «armed bandits» were merely puppets and not a legitimate political body; they would not talk to them. South Africa seemed to want the United States and perhaps even the Soviet Union in the mix, but Renamo said that the apartheid regime was an ally of Frelimo’s and therefore not a disinterested party. The Catholic Church continued to make quiet contact with Renamo representatives in foreign cities, and to exert pressure on the government through occasional pastoral letters. In two separate press conferences in Brussels and Dakar respectively during this period, President Joaquim Chissano seemed to open up possibilities for future talks of some kind in gnomic utterances about the acceptance of MNR fighters back into society if they renounced violence. The publication of Bill Minter’s 19-page research report The Mozambican National Resistance (Renamo) as Described by Ex-Participants in mid-March confirmed ongoing direct support to the «bandits» by the South African regime, and helped to strengthen the government’s diplomatic position even further. The report can be downloaded as a PDF file here. After Angola, Mozambique. Front File: Southern Africa Brief [Johannesburg] vol.3 no.3 (March 1989), p.1-2. In English. Click here to download a PDF file, size 320 kb. South Africa seeks a solution in Mozambique after the ‘success’ of the Angolan-Namibian settlement. Paul Fauvet. More false promises. Guardian [New York] (1 March 1989). In English. Click here to download a PDF file, size 100 kb. An account of the Pik Botha suggestion that the US might mediate an end to the Mozambican conflict, which appears not to have been fully thought out and may have been meant for domestic South African consumption. Maputo, Pretoria call on US to help end MNR atrocities. Herald [Harare] (2 March 1989). In English. Click here to download a PDF file, size 65 kb. Charles Freeman of the State Department says that Mozambique and South Africa have formally requested US intervention. Contactos exploratórios para a paz em Moçambique. Século de Joanesburgo [Johannesburg] (6 March 1989). In Portuguese. Click here to download a PDF file, size 68 kb. Tambayi Nyika. Peace lobby rebuffed. West Africa [London] (6 March 1989-12 March 1989). In English. Click here to download a PDF file, size 652 kb. Mozambique-South Africa: rebels reject mediation. Africa Research Bulletin, Political Social and Cultural Series [Exeter] vol.26 no.2 (15 March 1989). In English. Click here to download a PDF file, size 75 kb. A summary of news reports from the London Daily Telegraph (7 February 1989); the London Independent (14 February 1989); and the Johannesburg Citizen (17 February 1989). Peace moves on Mozambique. South African Broadcasting [Johannesburg] (17 March 1989), p.1-2. In English. Click here to download a PDF file, size 162 kb. Peace process shifts eastward? EASA: Trade and Investment in Eastern and Southern Africa [London] (17 March 1989). In English. Click here to download a PDF file, size 165 kb. Mozambican president addresses news conference in Brussels; welcomes any peace initiative. Summary of World Broadcasts [London] (20 March 1989). In English. Click here to download a PDF file, size 73 kb. Translation of a news report in Portuguese broadcast in Maputo on 17 March 1989. Renounce violence, MNR told. Herald [Harare] (21 March 1989). In English. Click here to download a PDF file, size 41 kb. President Chissano, addressing a press conference in Dakar, Senegal, says that his government will not talk to the MNR as an organisation, but that members who renounce violence will be amnestied under existing legislation. Chissano repeats refusal to negotiate with rebels. Southscan [London] vol.4 no.12 (22 March 1989). In English. Click here to download a PDF file, size 194 kb. 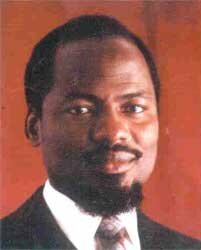 A more detailed report of Chissano’s remarks in Dakar. William Claiborne. S. African holds talks in Maputo. Washington Post [Washington DC] (24 March 1989), p.A4. In English. Click here to download a PDF file, size 98 kb. Article is retyped and reprinted in a US diplomatic newsletter. Mozambique: negotiations with Renamo? Indian Ocean Newsletter [Paris] (25 March 1989). In English. Click here to download a PDF file, size 29 kb. Interprets Chissano’s statements in Dakar as possibly opening the way to talks if Renamo accepts a cease-fire. Chissano define condições para dialogar com a Renamo. Século de Joanesburgo [Johannesburg] (27 March 1989). In Portuguese. Click here to download a PDF file, size 45 kb. More commentary on President Chissano’s remarks in Dakar. Desde que respeitam a independência e soberania, Moçambique está aberto a iniciativas de paz, afirma Joaquim Chissano em Bruxelas. Notícias [Maputo] (29 March 1989). In Portuguese. Click here to download a PDF file, size 91 kb. 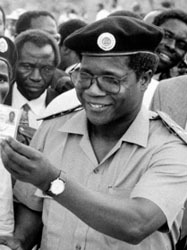 Above: Afonso Dhlakama, left, the leader of the Renamo insurrection, in military uniform in the early 1990s; and Joaquim Chissano, right, who succeeded Samora Machel as president of Frelimo and of Mozambique in late 1986. Mozambique insists MNR must renounce violence. African Business [London] (April 1989), p.6-7. In English. Click here to download a PDF file, size 66 kb. Mozambique: cease-fire proposals? Indian Ocean Newsletter [Paris] no.376 (1 April 1989), p.2. In English. Click here to download a PDF file, size 64 kb. A short report mentioning Margaret Thatcher’s visit to Zimbabwe, when she announced more British military instructors for the FAM; a meeting between Chissano and Pik Botha; a possible encounter in Maputo between Botha and Anatoli Adamishin; and William Minter’s report affirming continuing South African support for Renamo. Mozambique: a myriad of mediators. Indian Ocean Newsletter [Paris] (8 April 1989). In English. Click here to download a PDF file, size 46 kb. Possible mediators in the Mozambican conflict include the Catholic Church, which had made various contacts with Renamo representatives, the US, and even the Soviet Union. Ceasefire rejected by Maputo as Renamo attacks continue. Southscan [London] (12 April 1989). In English. Click here to download a PDF file, size 67 kb. A temporary ceasefire announced by Renamo in Lisbon was seen by the government as a ploy, and was rejected; in any case, attacks by the group continued. Mozambique: government dismisses MNR cease-fire call. A Rádio Moçambique broadcast on 12 April 1989, reported in Summary of World Broadcasts [London]. In English. Click here to download a PDF file, size 40 kb. Eddie Koch. A day after the peace, Renamo makes war again. Weekly Mail [Johannesburg] (14 April 1989-20 April 1989), p.3. In English. Click here to download a PDF file, size 51 kb. Chissano enuncia condições para paz na África Austral. Notícias [Maputo] (15 April 1989). In Portuguese. Click here to download a PDF file, size 113 kb. Mozambique: defence minister on negotiations with those supporting armed banditry. Extracts from a speech by Alberto Chipande on 21 April 1989 – «we are negotiating with the whole Western world, which supports the bandits»; reported in the Summary of World Broadcasts [London]. In English. Click here to download a PDF file, size 30 kb. Call for peace. Indian Ocean Newsletter [Paris] (22 April 1989). In English. Click here to download a PDF file, size 56 kb. A paste-up of two separate stories from the Indian Ocean Newsletter, done by Facts and Reports [Amsterdam]. Reports on a forthcoming pastoral letter from the Catholic Church, and the letter to Chissano from Claude Meillassoux, Christine Messiant, Michel Cahen and Jorge Der Luguian [sic, i.e. Georgi Derluguian]. Moçambique pede em Washington mediação americana na guerra. Século de Joanesburgo [Johannesburg] (24 April 1989), p.24. In Portuguese . Click here to download a PDF file, size 32 kb. Kenya is broker for Mozambique and rebels to explore peace possibility. Southscan [London] vol.4 no.16 (26 April 1989), p.124-125. In English. Click here to download a PDF file, size 217 kb. This page was posted on 22 June 2012 .